As the holiday season was coming to a close, I sat down and had a good hard think about the future of this site. With a spark of inspiration, I grabbed my planner and started laying out some projects and goals. This week, I’ve been putting some of those plans into action, and it only seemed fair for me to give you an update and let you know what I’ve got in store for the blog this year (..and give you some sweet January wallpapers!). As a brand, Violent Maiden is still staying true to its’ original roots, but this year I want to bring more of myself into the picture. I want to get to know you, and I want you to get to know me better! Aesthetically, I want this brand to remain sophisticated and minimalistic because I believe in a simple, uncluttered mindset. Within the next month, I will be rolling out some design updates and changes to the site so that it’s more practical to use. I want Violent Maiden to be a thriving makeup artist community filled with business and career advice. I don’t claim to be an expert on the subject, but I’m on a mission to find that information and provide it to you in one place. The blog is taking front and centre this year, with the hopes that we can grow a better community. In standard fashion, I’ll be aiming to write on the blog 1-2 times weekly. The favorite industry interviews will continue, and as the blog evolves, I’ll be looking to talk to even more industry professionals who can give you solid, practical advice on the business of makeup. As a graphic designer, I’ll also be looking forward to giving you my two cents on how to better brand yourself for success. The store will still run full steam ahead for those who haven’t yet got their paws on one of our set bags, but I’ll also be adding some digital products to the inventory throughout the year to help you get better organised. Daily planners, goal setting worksheets, resume templates and other delicious printables will be available in the shop soon, not to mention the load of free printables I’ve got planned for newsletter subscribers. Did you say January Wallpapers? 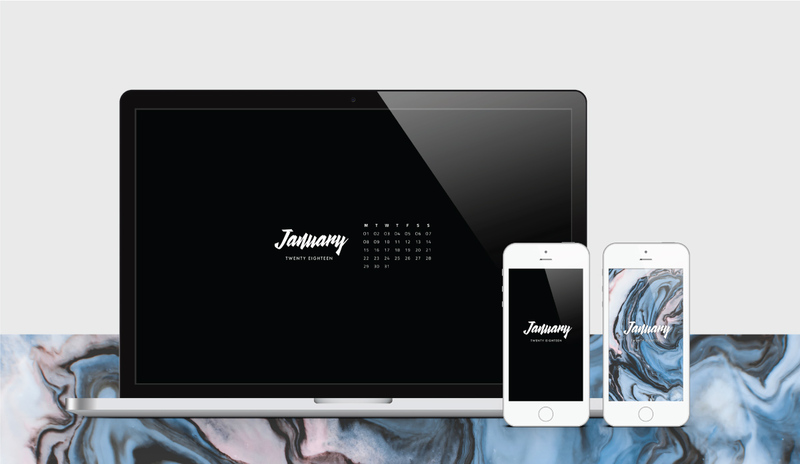 CLICK HERE to download your January Wallpapers! Enjoy your free January wallpapers and thank you so much for sticking around and helping violentmaiden.com to have its’ best year yet! While you’re here, what would you like to see from Violent Maiden in 2018?